Right now, the discussion of children and fitness is very important. According to CDC (Center for Disease Control), 1 out of every 3 children is obese or overweight. These children are at a higher risk of developing health problems like high blood pressure, type-II diabetes, and emotional problems. In order to minimize health risks, it is, therefore, important for parents to inculcate in children the habit of being physically active from an early age. The earlier children develop a liking for physical activity the greater the chances of them maintaining positive levels of fitness later on in their busy adult lives. Let us talk in more detail about what parents can do for their children at different ages. For children between the ages of 1 to 2 years old, it is important to have 60 to 90 minutes of outdoor activity in the presence of their parents. Toddlers are in their learning stage and they love to explore. So, break down the playing into supervised and structured play and unstructured but supervised free play. So give them 30-minutes of structured physical activity and at least 60 minutes of unstructured free play allowing them to explore and learn. These guidelines are as per the Nemour’s Foundation. One idea would be to get them small rocking boats and other toys. And do not forget to get them the most basic and most fun toy of all, a good ball. A ball alone could make for a whole hour of fun. You should encourage them to undertake easy activities like walking, running or kicking, in short. Learning to swim is a great idea. If you have a local park with an obstacle course, that would be a great idea for it helps to develop a great sense of balance. But do sure that they can undertake it without risk of injury. However, the risk of injury does not mean that you put them through activities that are not challenging. Small cuts and scrapes are to be expected and that is nothing you should lose sleep over. While playing with children is good, you should try to get them playmates that are nearer to their age. This helps them better learn social skills and develop themselves. The U.S. Department of Health and Human Services recommends that young people aged 6–17 years participate in at least 60 minutes of physical activity daily. 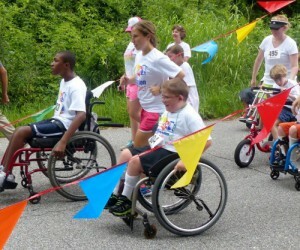 Children with disabilities are 38% less active than their peers without a disability. So, it is imperative that activity be a daily part of their lives. At the bare minimum children of this age group need to engage in physical activity that pushes their heart rate above their resting rates, and maintain this level for at least twenty to thirty minutes. As a guideline, the effort involved in continuous brisk walking is adequate to maintain fitness. This is the best age to help your children find a sport that they love. This makes for an exercise and a social activity that they could engage in for the rest of their lives. And the options are almost endless; it could be hand-cycling, football, tennis, baseball, basketball or even running or gymnastics.